Marriage is a huge step in one’s life. Two people are mutually deciding to spend the rest of their lives together, happily-ever-after. This is what everyone hopes will happen. However, real life frequently takes a different avenue. Whether it is due to a tragic breakup or merely a consensus, it is best and most comfortable for both parties to have a backup plan. When it comes to law, that back up plan is called a prenuptial agreement. Your local Lafayette Lawyer can organize this documentation. Prenuptial agreements provide both parties with protection. One would like to assume that their “loved one” would never do anything to hurt them. However, in life, you may have to learn the hard way, that people do change. We hope that it never comes to this, but if and when it does, this consensus allows for a smooth transition that leaves both parties with their agreed share. A prenup is decided beforehand, before marriage and before any disagreement can be foreshadowed, to protect the assets of both parties, as well as protect each other from their debt. That way if and when, the couple decides to split up they are automatically delivered ownership to what they had signed for before the split. Not only are prenups useful for protecting yourself, but they also play a crucial role in protecting your loved ones. If you have children from past marriages, you would like to assume that your current husband or wife would provide them with their fair share. However, to ensure such actions do take place you can include them in your premarital contract! This can span from who gets ownership of the family heirlooms to deciding who receives rights to the timeshare in Arizona. Whatever it may be, by mentioning it in your prenup you are ensuring that your children gain the legal right to what property you’d like to deliver to them. Without this, depending on the state, your spouse may be able to claim all or a significant portion of the property you wanted to give to your children. Also, another key benefit of prenups is avoiding future arguments. 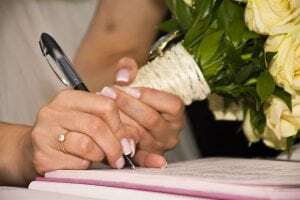 Deciding and clarifying financial rights before marriage and before any issues may have arisen is a lot smoother than talking out settlements during a divorce. Even though this is a grim occurrence to foreshadow, it is better to discuss who gets what assets or debts before the drama of another issue gets thrown into the mix. Last but not least, you do not want to be assigned debt that you did not acquire. A prenuptial agreement prevents such horrid happenings from taking place. Imagine breaking off connections with someone only to be haunted by their debt? This is a perfect example of what premarital contracts can save you from! Ensure that you and your spouse are doing each other a favor. Take the initiative to fill out a prenuptial agreement. If you need assistance of any kind, Bryan Coulter – Lafayette Lawyer – can advise you on the most optimal way to fill out your contract. We will ensure that you plan for the future efficiently and effectively, saving yourself and your loved ones from lost money, stress, and wasted time. Coulter Law can even provide you with the proper documentation. Contact us today, and prepare yourself for a stress-free tomorrow.